An effort led by Pacific Gas & Electric to change the state's wildfire liability law has been shelved for now. State Sen. Bill Dodd, co-chair of a joint legislative committee looking into wildfire preparedness and liability, confirmed to KQED on Friday night that changes to the state's inverse condemnation law — which allows courts to hold utilities liable for damage caused by their equipment even if they were not negligent — will not be coming this year. 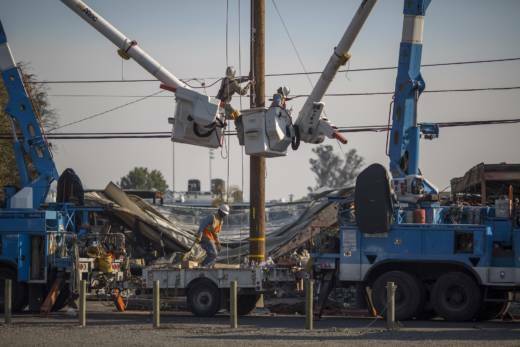 It's a blow to utilities, led by PG&E, which have spent millions this year on lobbying in Sacramento with a heavy focus on chipping away at inverse condemnation. State fire investigators have so far found PG&E responsible for 16 of last year's deadly and devastating Northern California wildfires. Representatives of the utilities argue that with climate change causing more frequent and destructive wildfires, public utilities won't be able to survive financially if they are held liable for damage their equipment causes. They warn that if they run into financial problems, the state's ambitious climate change goals could be at risk. PG&E did not respond to a request for comment on Dodd's statement that changes to the inverse condemnation law won't be happening this year. Critics of the utilities argue that any loosening of the inverse condemnation law would remove incentives for utilities to prevent their equipment from contributing to natural disasters. Gov. Jerry Brown is trying to chart a middle path to deal with the issue. His proposal would make it harder for fire victims to sue utilities for fire damages, while also raising fines for utilities that violate state safety laws and prohibit utilities from passing the cost of those fines onto ratepayers. "Just as our firefighting techniques and forest management must adapt to this growing threat, so must California laws," Brown wrote in a letter last month to the committee looking into wildfire preparedness and liability. "The law must establish powerful incentives for utilities to deliver power safely and must hold those who are at fault responsible for the damage they cause." Changes to the inverse condemnation law could resurface in the future, and Dodd said Friday that other parts of Brown's proposal are still alive. He said that the wildfire committee will continue to review other legislation related to wildfire preparedness. KQED's Marisa Lagos contributed reporting to this story.